Conservator Daisy Craddock specializes in the treatment and preservation of 19th Century, early modern and contemporary paintings. She opened CPC in 2005 with a commitment to providing museum quality treatments, along with exceptional service and skill. The firm also provides on site treatment of large scale paintings, murals, and historic interior finishes. As Principal Conservator, Ms. Craddock brings over two decades of experience to the company. She is a Professional Associate of AIC, and conservation treatments adhere to the AIC Code of Ethics. 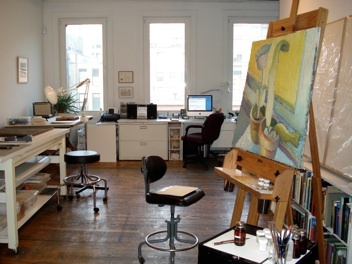 This small and discreet firm provides a wide range of conservation services for both private and public collections, and is conveniently located in Soho, New York City. Ms. Craddock personally carries out work on all smaller paintings in the conservation studio. She also collaborates on the aesthetic reintegration of artworks for other conservators in the NYC area. Large scale works are treated on site, thus avoiding unnecessary risk in transport. Upon request, Ms. Craddock can assemble a team of colleagues from throughout the conservation field for large scale on site projects. With over ten years of experience in the field, Ms. Craddock’s daughter, decorative painter Georgia Elrod, collaborates with the company on the conservation of historic decorative finishes. The CPC studio is open by appointment only. Situated in lower Manhattan, the CPC studio has keyed elevator access. Windows are coated for UV protection and provide excellent light for working, in combination with color corrected artificial lighting. The CPC studio is climate controlled and protected with a UL listed Central Station alarm system and additionally secured storage space within the conservation lab. Copyright 2018 Craddock Painting LLC, all rights reserved. Although the conservation studio is now closed, CPC is available on a limited based for collaborations with allied conservators in the field.